Microsoft Azure Active Directory Premium trial is now available. What are you waiting for? 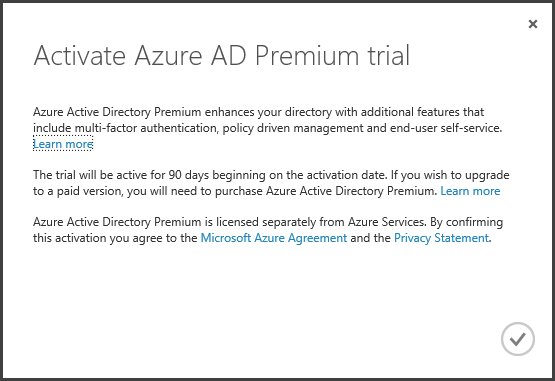 Well, for anyone who’s been asking when will it be available, it finally is – as of today, you can activate Microsoft Azure Active Directory Premium trial! UPDATE (July 1st, 2014): You can read more about it here. There is also a new, long-awaited feature, AAD Tenant Deletion, and you can find more about it here. P.S. If you still don’t have Microsoft Azure (trial or the “paid version”), you can acquire it here. So, today I’ve decided to move this blog to another “home” – from now on, it will be located at blog.kaniski.eu. I’ve decided to consolidate and reorganize things some time ago, and now I’ve finally managed to find the time needed (if Microsoft can change, who am I not to? I certainly hope that current (and future) ideas will be better organized this way. As you can see, I’ve created redirection on the previous location, and will leave it there until the domain expires. Sorry for the inconvenience and thanks for reading! P.S. I’m also fixing bad links and missing images – if you have something to report, send me an e-mail at [email protected] (yes, the About page is “about to happen” also). Thanks. Not so long ago (just before the WinDays14 conference in Croatia), I’ve written an article about Windows Azure Backup (now called Microsoft Azure Backup because of a renaming scheme that followed little after the article was sent to be published). This article was written for the special, conference edition of Mreža magazine. Unfortunately (for some), this article is in Croatian. In general, it’s a 2 page Microsoft Azure Backup overview – what can it do, how easy it is to set-up, how it can ease the burden of doing backups, how can it be incorporated into the current backup policy and extend it off-premise, etc. You can find and read the article using the specialized Windows 8/8.1 app called Bug & Mreža (or direct link) – app created for reading the digital editions of two of our largest IT magazines, Bug and Mreža). With weekend just around the corner, maybe now is the right time to try Microsoft Azure and, more specifically, the Microsoft Azure Backup feature? UPDATE (June 14th, 2014): This article was re-published in Mreža magazine, "regular" (not WinDays) edition, July 2014. Makes me proud. Again.